BMW Group: Happy birthday to 100 years! 2016 sees the BMW Group celebrate its centenary under the motto THE NEXT 100 YEARS. Throughout its history, the company’s image has been defined by a future focus and pioneering action – all made possible by its extraordinary team of employees, who share a fascination for mobility which is integral to all our lives. Three qualities in particular set the BMW Group apart: the capacity to learn and adapt, technological innovation, and a sense of responsibility toward society. “We have demonstrated on many occasions throughout our history that we are capable of learning fast and taking bold steps,” Harald Krüger, Chairman of the Board of Management of BMW AG said. Against this background, the BMW Group’s centenary celebrations are set to focus primarily on what lies ahead and explore how individual mobility might develop over the coming decades. To answer this question, the BMW Group has generated a futuristic scenario with a clear vision: premium mobility by the BMW Group will be completely effortless, comprehensively available and tailored to every customer’s individual preferences. At the moment, the world is on the verge of realising automated driving; in the not-too-distant future the majority of cars will probably be completely self-driving and travel the streets of cities inhabited by far more people than today. The BMW Group has now made its vision for the future a reality – with the BMW VISION NEXT 100. This vehicle combines coupé-type sportiness with the dynamic elegance of a sedan – but rather than being an anonymous transport machine, it is a highly customised vehicle that is perfectly tailored to suit the driver’s changing needs. Driver-vehicle interactions are managed by Alive Geometry; Boost and Ease modes offer a choice of driver-controlled or vehicle-controlled operations, and the interior of the vehicle changes to suit the mode of travel. In Boost, the entire vehicle focuses on the driver, offering the support needed to maximise the driving experience – for instance by indicating the ideal driving line, steering point and speed. Ease mode sees the interior transform: the steering wheel and centre console retract; the headrests turn to the side, and the seats and door trim merge to form a single unit so that the driver and front-seat passenger can turn towards each other. 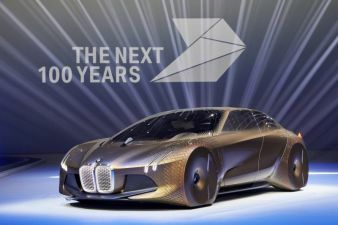 The BMW Vision Vehicle made its world debut at the Centenary Event in the Munich Olympic Hall on 7 March 2016 – exactly one hundred years after the company that is now known as BMW AG was first entered into the commercial register. After its world debut, the BMW VISION NEXT 100 will go on a symbolic World Tour entitled “Iconic Impulses.” stopping in China, the UK and the USA. After its Asian premiere in Beijing, it will travel to London, where the Vision Vehicles of the BMW Group’s British brands – MINI and Rolls-Royce – will be unveiled. Its last port of call will be Los Angeles, USA, where BMW Motorrad will add its Vision Vehicle to the collection to complete the quartet of brands. Key content from “Iconic Impulses.” will also be on show in Munich as a permanent exhibition. The Future Exhibition in the ‘double cone’ structure of the BMW Welt will open to the public in spring. A further exhibition will be mounted by the BMW Museum, where a temporary centenary display entitled “100 Masterpieces” will present milestones in the history of the BMW Group. It will be open to the public from 10 March onwards. From 9-11 September 2016, the BMW Festival – THE NEXT 100 YEARS will welcome fans from all over the world. It will take place in the Munich Olympic Park, including the Olympic Stadium and Hall. The BMW Museum and BMW Welt will also be involved, as will the entire area around the iconic ‘four-cylinder’ headquarters building. To round off the centenary year, there will be a special publication consisting of 13 volumes. This will outline the history of the company and discuss key future topics. The books will contain a mix of essays, reports, studies and expert interviews. They will reflect the diversity of the BMW Group and its BMW, MINI, Rolls-Royce and BMW Motorrad brands. To mark its centenary, the BMW Group is also enhancing its commitment to social responsibility. The capital of its foundation, BMW Foundation Herbert Quandt, will be increased by €50 million to a total of €100 million. In addition, annual donations will be made to support project work. In 2016 this financing will amount to another €5 million. Further financing will be provided by major shareholders Stefan Quandt and Susanne Klatten, who will support project work with an additional €30 million.